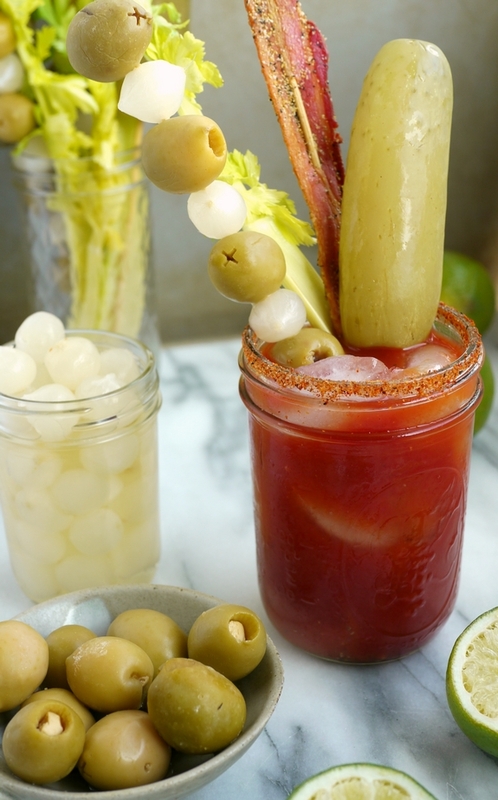 When your dill pickle enthusiasm crosses over into your cocktail and bacon obsession, you make a Dill Pickle Bacon Bloody Mary and call it a day. I’m trying to recall when I had my first Bloody Mary…that I actually liked. I’ve always loved tomato juice so it seemed natural I would enjoy a Bloody Mary, however, it just didn’t happen for me. I tried (so many Sunday brunches) to like them, but they always tasted so sharp and just yuck. I know so many of you are agreeing with me right now about that sharp taste. I have a feeling bars use cheap vodka in their Bloody Mary drinks, thinking everyone just wants to get drunk. It’s so not true! Anyway, over the years I have come to love all things Bloody Mary. And if you love just a plain ole’ regular Bloody Mary recipe, I highly suggest making The Best Bloody Mary Ever. It’s a favorite for sure. I even make Bloody Mary Soup that will be amazing for your next brunch gathering. It’s fun to serve on Halloween too. We’ve all established my obsession with all things dill pickle. And if you’re eating dill pickles, you might as well just include bacon. Why not? 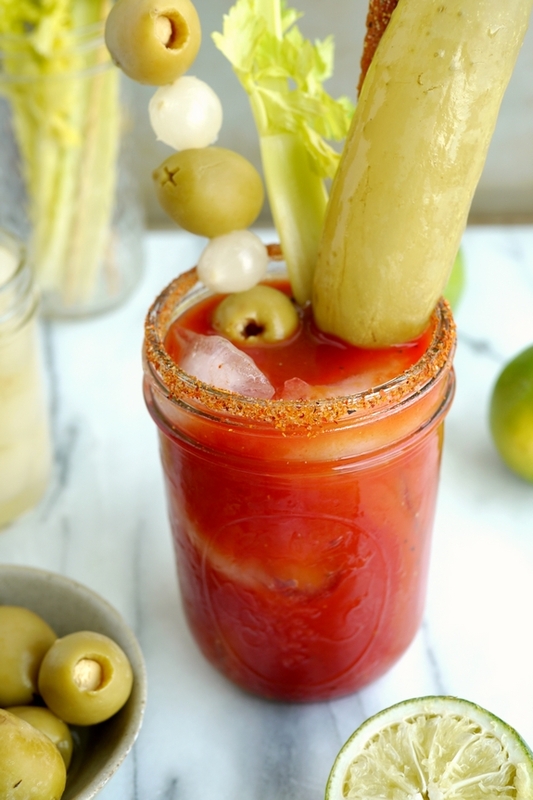 And ever since I saw Bakon Vodka (that’s how they spell it) at the liquor store, I knew I wanted to combine it with dill pickle juice for the ultimate Bloody Mary. Sounds good right? Surprisingly the vodka’s bacon profile does come shining through. It’s my new Bloody Mary vodka for sure, but I am trying to think of other ways to utilize it. I’ll get back to you on that. 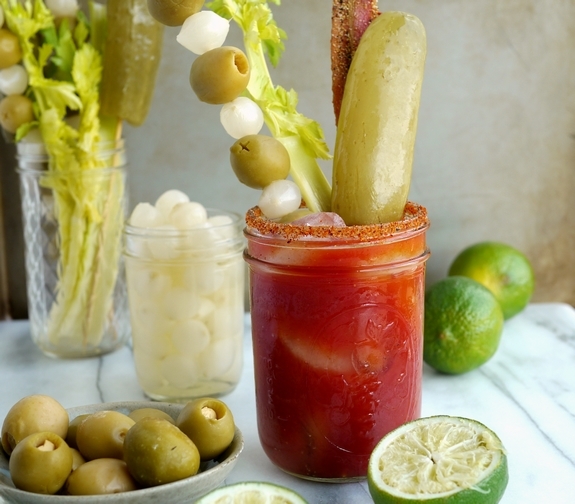 This is a fun Bloody Mary to garnish with bacon strips and giant dill pickles, obviously. Cocktail onions and stuffed olives are also a must. A side of tater tots would also be amazing with this delicious Bloody Mary. You can also put anything on the rim of your Bloody Mary glass. 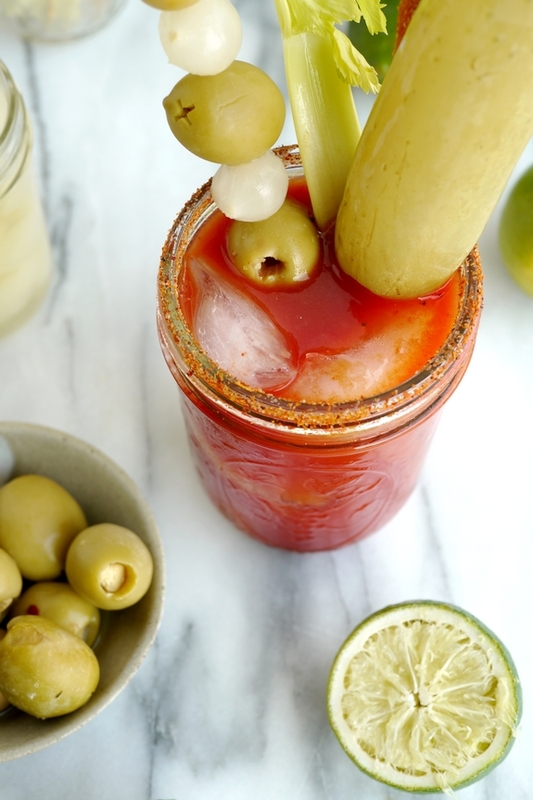 I love adding Tajin seasoning to the rims of my Bloody Mary’s…it’s the perfect seasoning for this type of drink. Dip the rim of a 16 oz wide-mouth mason jar into fresh lime juice and then into the seasoning of your choice. To the glass add dill pickle juice, Bakon vodka, Worcestershire, Tabasco and lime and give it a little stir. Fill the glass to the top with ice and fill with Bloody Mary mix. Use a spoon to stir several time and get everything mixed. Add garnishes and serve immediately. Note: Use dill pickle juice from pickles you love. This is important since the pickle flavor does come through. If you are interested (and why wouldn’t you be) in creative Bloody Mary recipes, I might give this Bloody Mary Salsa a try. And I don’t think I would ever turn down these Bloody Mary Chicken Wings, would you? My next cocktail party is going to include these Bloody Mary Roasted Tomatoes, Bloody Mary Bruschetta Bites and these Skinny Bloody Mary Deviled Eggs. Five years ago I made these Mediterranean Style Beef Quinoa Stuffed Peppers and they were amazing. Seven years ago I threw together this Shrimp over Coconut Rice and it was equally fabulous. I highly suggest making them both. This looks amazing! I hate the burning of cheap vodka in most Mary’s. I love tomato juice but have a hard time finding a Bloody Mary that has flavor vs cheap alcohol burn. This is right up my alley, and I can’t wait to try it. :). Cathy, this sounds AWESOME! I, too, was a late bloomer to Bloody Mary’s. Now this is a bloody mary I can get behind!!! When can I come join you for one (or two) of these?! Sounds delish! Oh my gosh YES!! I need this! One of my favorite things! How can you go wrong with bacon and a little zip of dill pickle! 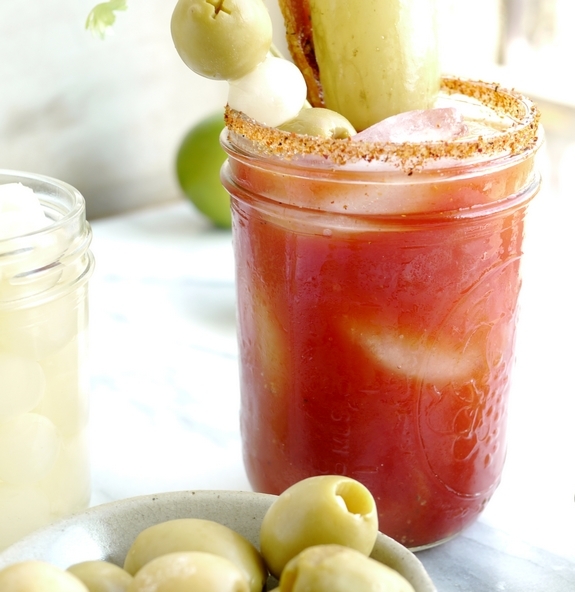 Pickles, bacon and green olives — I’m so in love with this drink! Now this is my kind of Bloody Mary! So much better than the kind they make and serve around here! Cicero Beverage Co makes a Bacon Bloody Mary Mix made with Real Bacon pieces! Finally a perfect spiced bloody mary recipe, I’m very impressed by this! I might get into trouble this weekend making a bunch of these…. haha thanks for sharing!